I love a thinner crust pizza and flatbreads so I was excited to try the new Firebaked Style Flatbread Pizzas from Pizza Hut. Flatbreads are very trendy right now and Pizza Hut responded to their customer requests by creating an innovative new offering with this new lighter crust. These flatbread pizzas may have a thin crust but are definitely not lacking in taste because it packs a big flavor punch. The wood fired style crust has a slight crunch with a pleasant chewiness and is topped with real cheese and high quality toppings. 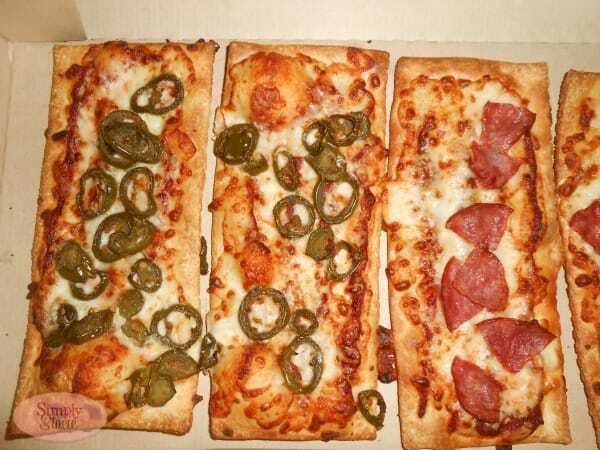 There are six flatbreads in each box and I love that I can choose up to three individual toppings. Therefore each of my family members can enjoy their favorite topping(s) and everyone is happy! We really enjoyed our Firebaked Style Flatbread Pizza and we chose pepperoni, ham and jalapeno peppers for our three individual toppings. My children loved the crispy and slightly chewy crust topped with cheese, a tasty sauce and toppings which covered their flatbread all the way to the edges. I love a spicy pizza so the jalapeno flatbread was full of flavor, spice and it was absolutely delicious. As I am watching my portions, I was very pleased that one of the flatbreads was surprisingly filling and I didn’t even need another slice to feel satisfied. Pizza Hut offers so many wonderful options at affordable prices so pizza night with my family doesn’t break our budget. I appreciate that I can feed a family of five including my husband’s favorite-Pan Pizza for under $25. The new Firebaked Style Flatbread Pizzas ($11.99 for a box of six flatbread pizzas) are now available at all Pizza Hut locations nationwide (US only) and you can also order it online at PizzaHut.com. Connect with Pizza Hut on Facebook and Twitter too! Yum, these look really good. 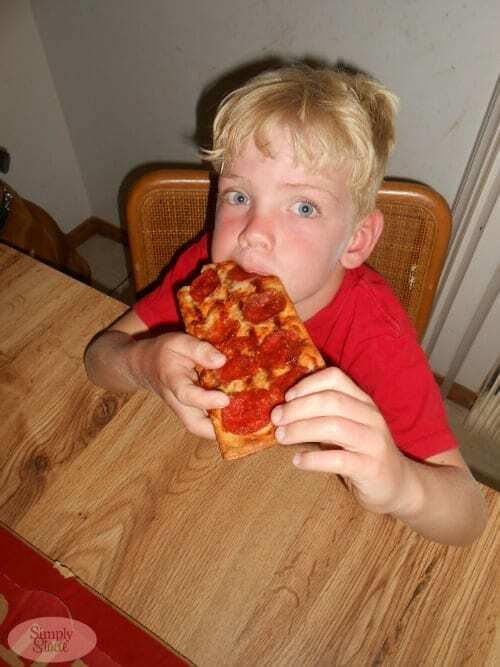 I miss having Pizza Hut. And the price is good for what you get, too. now these pizzas look good. not like some of their ideas that really turn me off. Mmm.. these look really good! Thanks for sharing! I saw the commercial for these the other day and thought they looked great. I am glad you think they taste good. I love that it is a thin crust. I have not tried it but now am interested in trying it. From the look of your son’s face it must be great! I have been watching the commercials for these and I really want to try them. Your review makes me want to try them even more. I too am watching my portions and this seems like a great dinner for my family. I haven’t tried those yet! They sure look delicious! Oh, how I miss pizza. My son is allergic to milk, so we haven’t had pizza in forevs. I haven’t tried those yet, but we do love their thin-n-crispy pizza! I haven’t had Pizza Hut in a long time but I do love Flatbread so I think I’ll give it a try. Your photos are very enticing..lol. These look so good! I like that you can get 3 different ones to please everyone in the family! Thanks! not a big fan of pizza hut, however, they do give some good freebies. i did have a coupon for the flatbread pizza at chili’s and it was so good, i am not a pizza lover…. i’m generally not a fan of flatbreads but this looks soooooooo good. i prefer their pan crusts though! My husband and I are huge fans of very thin crust pizza – I am sure we’d LOVE this! Haven’t tried these yet, but we keep seeing the commercials. They look delicious! It’s kind of crazy how much that doesn’t look the the picture in their ad – I guess that’s why we’ve switched to the local pizza places! That looks so good and at a reasonable price! My mom, brother, and sister would love this. We traditionally get their $20 Dinner Deal box. I like the toppings of mushrooms, black olives, and Canadian bacon whenever I get pizza. These look AMAZING! I love the fact you get 6 in a box – perfect for a group that can’t decide on what toppings to get! The price is pretty great too – hopefully we’ll get these in Canada soon! I don’t usually eat at pizza hut because I have to eat gluten free, but that pizza looks good! Wow love this idea! Everyone can pick what they want on their pizza! Will check this out next time we order from Pizza Hut! These look good. I do like Pizza Hut. My kids are fans of just plain pepperoni pizza so I think they would really like this! I’ve been interested in trying these. I like the idea of being able to pick your own toppings, but I like lots of cheese and less crust so I was worried about it lacking since here is a crust all around. Your review sounds like here is plenty of cheese throughout. Those look good! I hadn’t heard about them before. Have been curious about these flatbread pizzas from Pizza Hut! I’m really glad to see a review on these. I was wondering if they were good and how big they were. I like the idea of being able to have 6 different flavors because with a family of 6 I never get to have the toppings I like. I’m a deep-dish pizza lover, but these look so good – they would make a nice change of pace from my usual thick pizza.